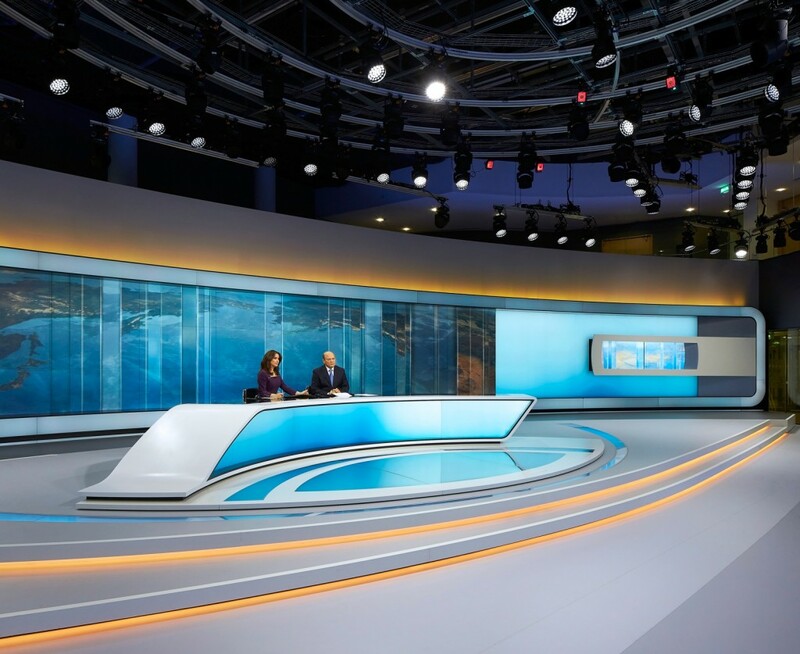 Making a response to the growing demand for multichannel, multiplatform broadcast environments, VXV designed open-plan production facilities that combine live newsgathering, digital media and automated lighting. Architecture and broadcast design were seamlessly combined to leverage the potentials new digital media create. 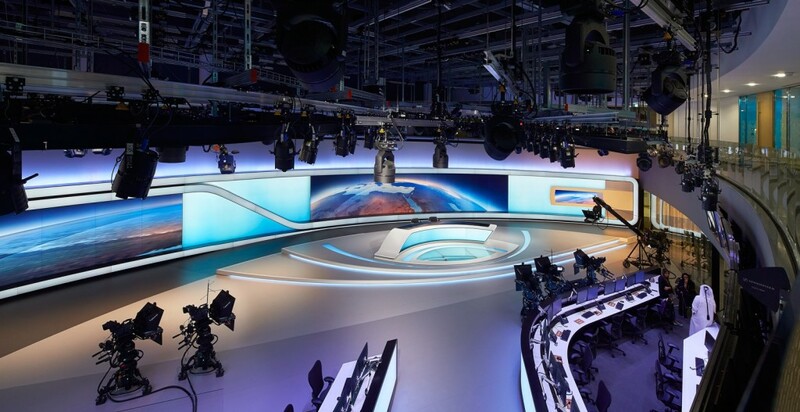 The global shift towards 4K newsrooms is fuelling the demand for networked digital spaces and integrated data distribution systems. 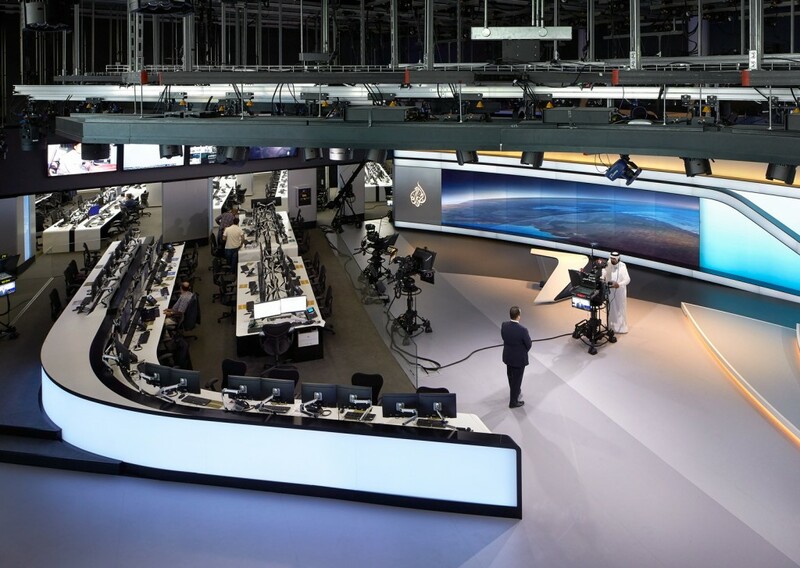 When Al Jazeera Media Network commissioned VXV to create the new flagship broadcast studio and newsroom for their Arabic-language broadcast service in their Doha headquarters, the forward-looking facility they designed set a new standard for the industry. 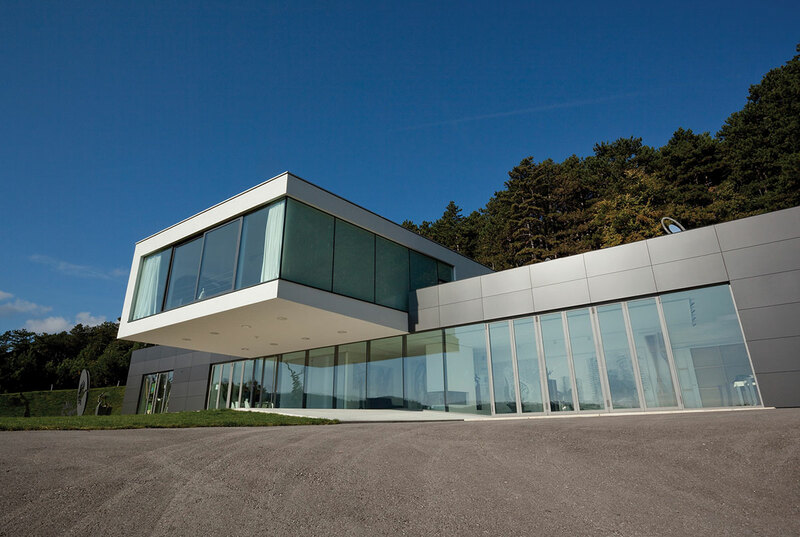 Conceived as a hybrid broadcast studio and production workplace, the 1,100m² studio contains three individual sets bordered by open-plan areas with space for 100 workstations. Constructed in a space spanning two levels, the studio and workplace are flanked by galleries that provide egress for visitors and employees from other parts of the complex. The facility’s long, lateral proportions and 360º perspectives provides space for more than 70 different camera positions and sweeping vantage points across all parts of the studio. The studio’s fluid layout also creates the flexibility to develop individual sets and special formats for regular programmes and ‘breaking news’ bulletins. 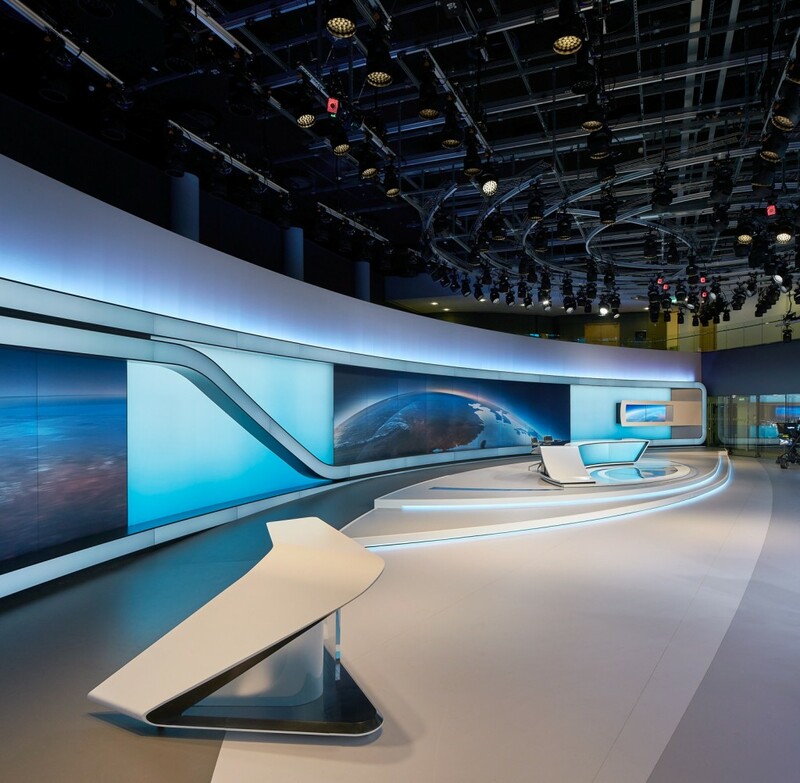 A wide range of broadcast technologies were integrated into architectural components and digitally-enabled surfaces to make media migration from one news production system to another as seamless as possible. The technologies automatically capture contextual metadata collected during newsgathering and make it easier for the production team to synchronise it with on-screen graphics, video clips and Augmented Reality visuals. 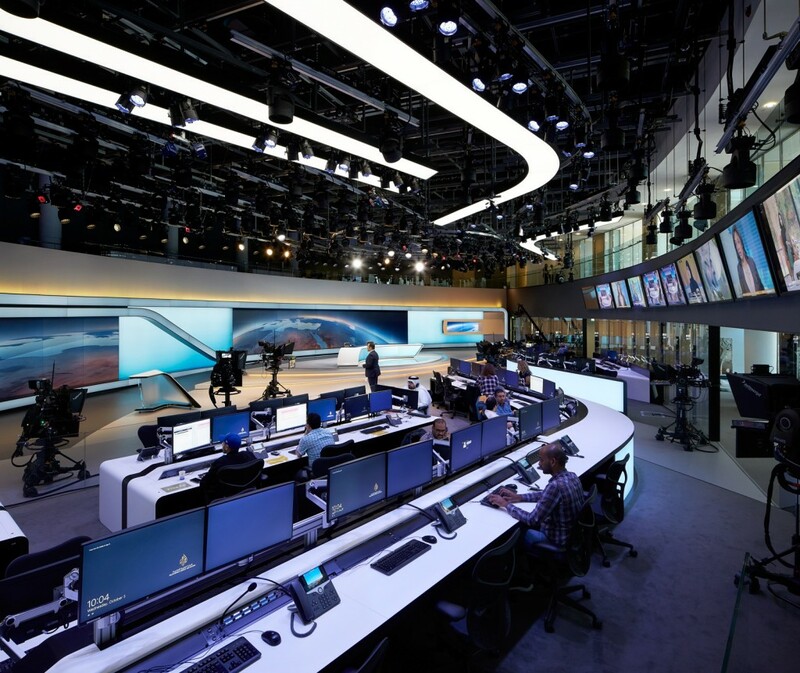 The studio facilitates dynamic communications between newsroom computer systems and news production systems. Embedded technologies relay data to the lighting systems, cuing them to alter illumination levels, change colour or respond to new camera angles. 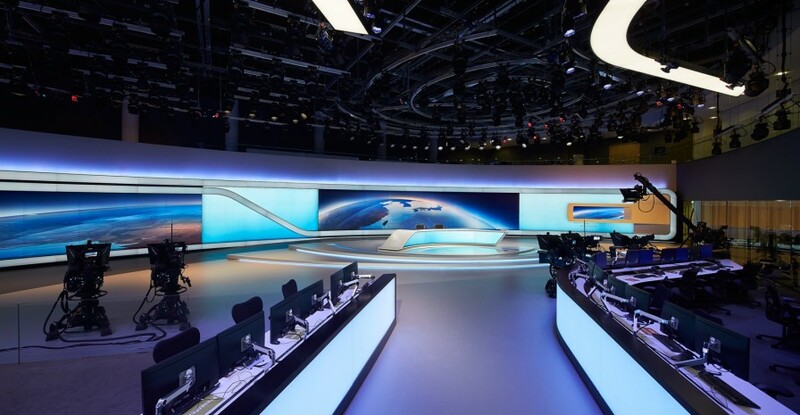 As broadcast environments become increasingly digitalised, VXV are designing for an increasingly virtual world. 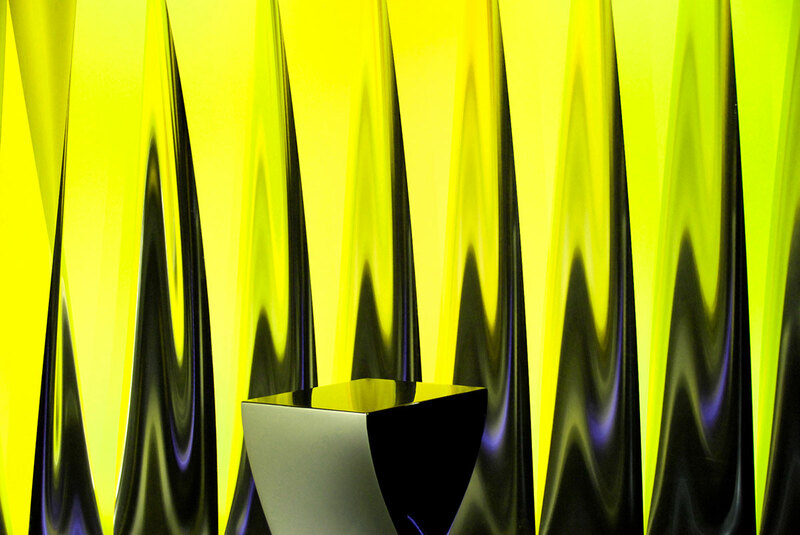 Intangible features, such as transparency, fluidity, flow and agility are as essential to production and broadcast as they are to the spatial parameters inside the studio. As a result, the new studio comprises a multichannel system that merges media production and metadata intake into a single workflow, making production and distribution flexible, faster and more efficient.